Known as Atlanta's "second suburb," Druid Hills has evolved into one of the city's most affluent neighborhoods while remaining a tight-knit community. Druid Hills was developed during the late 19th and early 20th centuries by Joel Hurt, the developer of Inman Par, Atlanta's first suburb. In his quest for the "perfect suburb," Hurt employed the talents of Frederick Law Olmsted, the founder of landscape architecture and designer of landscapes for Inman Park, the U.S. Capitol, Central Park in New York City and the Biltmore Estate in Ashville, N.C. Hurt was also assisted by Asa Candler, the founder of the Coca-Cola Co. 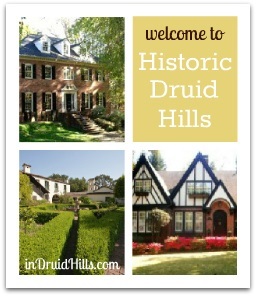 Located about five miles east of Atlanta's downtown, Druid Hills has been the address of many notable Atlanta residents. The neighborhood has four National Register districts: Druid Hills, Cameron Court, Emory Grove and University Park-Emory-Highlands-Emory Estates. Home styles include Georgian, Tudor, Jacobean, and Italian Renaissance as well as early 20th Century Victorian mansions and small bungalows. The neighborhood has about 15,000 residents and is part of DeKalb County. Its main employers include Emory University and the Centers for Disease Control and Prevention. Fernbank Forest and Recreation Center is on the neighborhood's southeast side. Druid Hills is also home to the Atlanta Boy Choir, a renowned choral group of boys and men that has performed internationally. School children living in Druid Hills are zoned for DeKalb County Schools. Druid Hills High School is one of the oldest schools in the district, and was originally founded in 1914 on the Emory University campus as a K-11 school to serve the children of faculty. It was moved to its current location in 1928. The school was renovated in 2009 and follows the International Baccalaureate curriculum.